After breakfast, depart for Hanumanchatti (40 kms), then 8 km by local jeeps till Janki Chatti. Here you will begin the First Pahad Vatra of Yamunotri (5 kms trek). You can hire a Doli or a horse, for your trek (Cost Not Included). Yamunotri (altitude 3,291 m), the western most shrine of the Char Dhams, is dominated by Banderpunch (6,361 m). Yamunotri is the source of the river Jamuna, the twin sister of Yama, the Lord of Death. Anyone who bathes in her waters is said to be spared a tortuous death. Yamuna is also the daughter of Surya the Sun. The actual source of the river originates from Champasar Glacier 1 km ahead of the shrine; at an altitude of 4,321 mts. Pilgrims do not frequent the source of the river as it is not easily accessible. 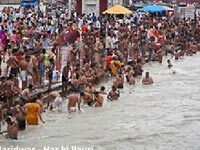 After performing pooja, take holy dip in Yamuna River and take the same route back to Barkot. In the morning, drive (85 kms - 3 hrs journey) to reach Uttarkashi. Check in into the hotel. 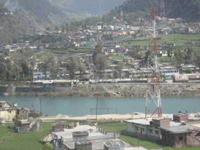 Uttarkashi is situated on the banks of river Bhagirathi and is famous for its historical monuments, Temples & Ashrams. In the evening, Visit the famous Vishwanath Temple. Early morning after breakfast check out from the hotel and depart for Rudraprayag via, Tehri Dam. Upon arrival at Rudraprayag check in at the hotel. On reaching Kedarnath, visit the temple for darshan of the resident deity. One of the holiest Hindu pilgrim sites dedicated to Lord Shiva, Kedarnath Temple is perched at an altitude of 3,584 meters a midst towering snow-clad Himalayan peaks on the head of river Mandakini. The original temple is said to have been built by the Pandavas to atone for their sins procured during the Kurukshetra war of Mahabharata. The present temple was reconstructed by Adi Sankaracharya in the 8th century. One of the 12 Shiva-Jyotirlingas resides in this temple. Inside the temple there is an irregular, three-faced linga, representing the hump of Lord Shiva when he took the form of a bull. There are deities of goddess Parvati and Ganesh in front of the main altar door. Outside the second door are Lord Krishna, the five Pandavas, their wife Draupadi, and their mother, Kunti. This morning, after an early breakfast, you check out of the hotel at 7.30 am and drive to Badrinath (165 kms - 6 to 7 hrs) via Joshi math. After driving through some wonderful ghat road and probably couple of landslides you arrive at Badrinath by 2:30 pm. Check into the hotel. After some rest and refreshments you are all set to go to Badrinath Temple for darshan in the evening. 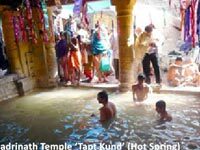 But first you have to go to Tapt Kund (Hot Spring), take bath and then go to the temple. Dedicated to Lord Vishnu, the temple of Shri Badrinathji is 15 meters in height, built in the form of a cone with a small cupola of a gilt bull and spire. Legend dates the temple prior to the Vedic age, though the present temple is believed to have been established by Adi Shankaracharya, the 8th century A.D., and Hindu reformist. The temple has been renovated several times due to earlier damages by avalanches and looks modern now with a colorful "Singh Dwara" or the main entrance gate. The temple has three parts - Garbha Griha (the sanctum sanctorum), Darshan Mandap (for pooja’s) and Shobha Mandap (for devotees to assemble). There are 15 idols in the temple complex. Finely sculpted in black stone, the Badrinath (Vishnu) image is a meter high. Other images include those of Laxmi Rishikesh is certainly one such town. (Vishnu's consort), Garurh (Vishnu's mount), Shiva, Parvati, Ganesh etc. After darshan, return back to the hotel or visit the town and shop around. In the evening, you'll be taken tp Parmarth Ashram to participate in the Ganga Aarti on the banks of Ganges. Rest of the evening frees to experience this fascinating town on your own. Early morning, after breakfast, you a re on you r last lap of this journey. Drive back to Delhi (260 kms - 7 to 8 hrs) stopping enroute for a couple of hours at Haridwar to take a ritual bath at Har ki Pauri on the banks of Ganges.